One of our goals in 2017 is to improve our social media strategy. We want data to inform our strategy, understand what content our audience likes best, and identify best practices for posting to our Twitter account. We then calculated the engagement rate by dividing the sum of all reactions (replies, likes, and retweets) by the number of impressions. Through this process several trends and patterns became apparent which should help us improve the performance of our tweets. We concluded that using photos and text at the same time generated more engagement than the other types of media. To understand our content further, the next step for us was to figure out what type of topics our followers are interested in, regardless of the media type. 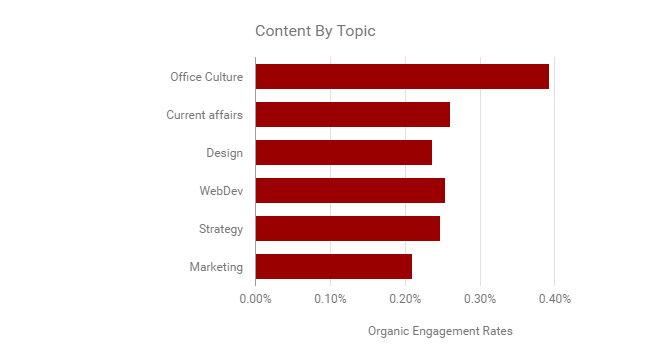 Following the same process, we broke our content into content topics: office culture, design, web development, current affairs, marketing, and strategy. We then compared the engagement rates once again. From there we saw that company culture was performing best compared to the rest. This result was interesting to us, since our original assumption was that company culture content was not well suited for Twitter. Timing, character counts and, hashtags. Do they really matter? It’s the right time to tweet! Choosing the right time to tweet your content is important. Twitter displays the most recent Tweets first so older posts usually get less attention. Which raises the question, when is it the right time to tweet? In order to answer this, we grouped our tweets into time frames of one hour, then looked at the combined engagement rates for each time frame. From our data plotted above, we noticed that the best time to tweet is between 10am and 1pm ET. Lunchtime is often when people get a chance to check their Twitter feeds. Another spike in engagement is seen around 5pm to 7pm ET, which aligns with most people’s commute home from work. 140 characters, to use them all, or not? Surprisingly, having the ability to write more does not mean that we should. Our best performing tweets were either 30 to 40, or 60 to 70 characters long. Although the results are not conclusive, this still suggests that our audience is looking for precise and direct information. Hashtags on Twitter are used to bring conversations on the same topic into a single thread. This makes finding information more convenient for the audience. But does using hashtags increase engagement? Does using more than one hashtag lead to even more engagement? And, how many hashtags are too many hashtags? By organizing our data into groups showing the number of hashtags, then comparing the average engagement rate, we were able to gain a better understanding of how we can improve this part of our digital strategy. Our data for hashtags is kind of all over the place. Using three hashtags generated the most engagement for our content. However this is by no means a sign that more hashtags are better, because using no hashtag performed better than using one or two. Although this data did not help us get to a decisive conclusion, to us it suggests that hashtags are still useful if they are relevant to the content you post. Our best performing tweets were about our office culture and included a mix of photos and text. Tweets that just included links without much context performed worst. Our best windows for posting tweets were between 10:00 am and 1:00 pm ET and 5:00 and 7:00 pm ET. Although the results weren’t completely conclusive, shorter tweets tended to perform better for us than longer ones. Note that each Twitter account and audience is unique. Our results may be different from yours. Given that we would encourage you to perform your own audit based on your own custom criteria that you develop.